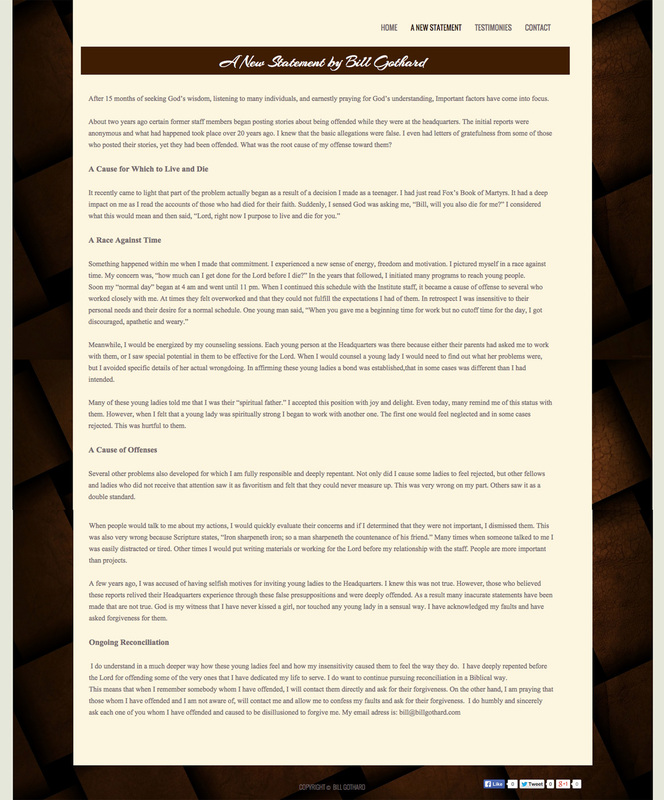 Yesterday Bill Gothard, the disgraced former leader of IBLP and ATI, unveiled a revamped website with some new additions. And then promptly deleted them. Gothard had previously released a statement in on April 17, 2014 (archived as a PDF here), about the allegations where he agreed that his “actions of holding of hands, hugs, and touching of feet or hair with young ladies crossed the boundaries of discretion and were wrong.” But in yesterday’s new statement, Gothard dismissed the allegations entirely as “false” and chalked them up to jealousy on the part of victimized girls. 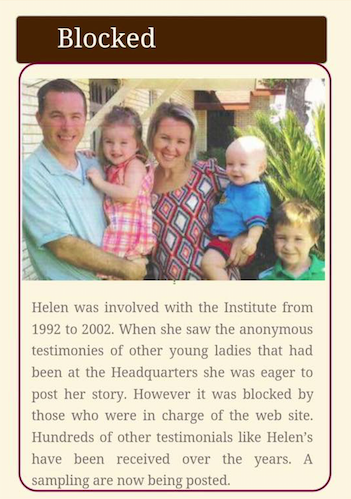 Helen was involved with the Institute from 1992 to 2002. When she saw the anonymous testimonies of other young ladies that had been at the Headquarters she was eager to post her story. However it was blocked by those who were in charge of the web site. Hundreds of other testimonials like Helen’s have been received over the years. A sampling are now being posted. After 15 months of seeking God’s wisdom, listening to many individuals, and earnestly praying for God’s understanding, Important factors have come into focus. About two years ago certain former staff members began posting stories about being offended while they were at the headquarters. The initial reports were anonymous and what had happened took place over 20 years ago. I knew that the basic allegations were false. I even had letters of gratefulness from some of those who posted their stories, yet they had been offended. What was the root cause of my offense toward them? Something happened within me when I made that commitment. I experienced a new sense of energy, freedom and motivation. I pictured myself in a race against time. My concern was, “how much can I get done for the Lord before I die?” In the years that followed, I initiated many programs to reach young people. Meanwhile, I would be energized by my counseling sessions. Each young person at the Headquarters was there because either their parents had asked me to work with them, or I saw special potential in them to be effective for the Lord. When I would counsel a young lady I would need to find out what her problems were, but I avoided specific details of her actual wrongdoing. In affirming these young ladies a bond was established,that in some cases was different than I had intended. Many of these young ladies told me that I was their “spiritual father.” I accepted this position with joy and delight. Even today, many remind me of this status with them. However, when I felt that a young lady was spiritually strong I began to work with another one. The first one would feel neglected and in some cases rejected. This was hurtful to them. Several other problems also developed for which I am fully responsible and deeply repentant. Not only did I cause some ladies to feel rejected, but other fellows and ladies who did not receive that attention saw it as favoritism and felt that they could never measure up. This was very wrong on my part. Others saw it as a double standard. When people would talk to me about my actions, I would quickly evaluate their concerns and if I determined that they were not important, I dismissed them. This was also very wrong because Scripture states, “Iron sharpeneth iron; so a man sharpeneth the countenance of his friend.” Many times when someone talked to me I was easily distracted or tired. Other times I would put writing materials or working for the Lord before my relationship with the staff. People are more important than projects. A few years ago, I was accused of having selfish motives for inviting young ladies to the Headquarters. I knew this was not true. However, those who believed these reports relived their Headquarters experience through these false presuppositions and were deeply offended. As a result many inacurate statements have been made that are not true. God is my witness that I have never kissed a girl, nor touched any young lady in a sensual way. I have acknowledged my faults and have asked forgiveness for them. I do understand in a much deeper way how these young ladies feel and how my insensitivity caused them to feel the way they do. I have deeply repented before the Lord for offending some of the very ones that I have dedicated my life to serve. I do want to continue pursuing reconciliation in a Biblical way. 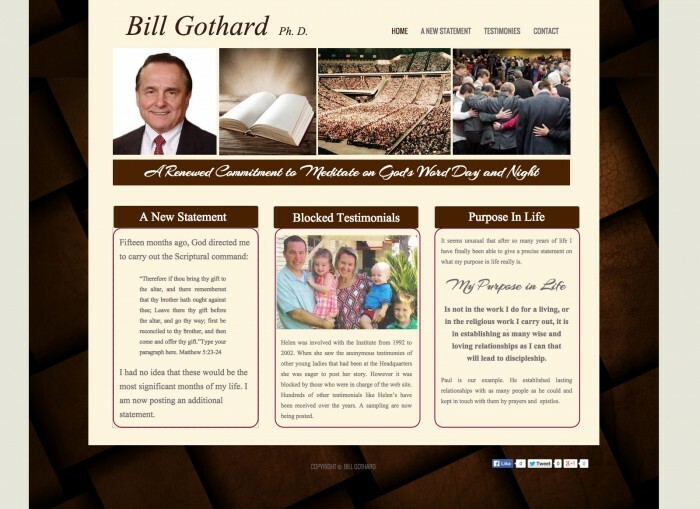 The original url of the “New Statement” was http://subdomain.billgothard.com/attorneys-1.html. One thing that we would like to briefly address is the accusation posted that we “blocked” a story of someone who wished to support Bill Gothard. Our policy from day one has been to never block a dissenting viewpoint unless it is abusive, profane, or consistently unkind. In the case of Helen, her story came in the form of a comment on one of our articles. This comment was approved and remains on our site until this day. It can be viewed here. Bill Gothard unveils new statement, his personal lawyer and IBLP’s lawyers promptly call…? I wonder if he was afraid that Jim Bob and Michelle would out him? Perhaps Jim Bob called “Brother Bill” after the interview to let him know that they didn’t turn their backs on their faithfulness to their fearless (fear of God) leader? From what I read in his statement, the only faults he considers himself to have had were working too hard and trying to help too many people. Interesting self-awareness there. Remembering the era whenGothard’s seminars were the Big Thing some of my friends went to. Gothard seemed the Absolute Authority to them. Wondering today…as I read his now-deleted statement. Did he ever have an accountability group he had to report to? There was a reason the US government did not want kings when we were founded…and ministries should not have unaccountable kings also. What worries me is his comment about trying to contact people/women whom he has assaulted in the past. Ostensibly to ask for their “forgiveness”. ICK. An 80 year old man who is proud that he’s ‘never kissed a woman’…What could go wrong with someone like that?! En todas las Iglesias Cristianas, hay personas SALVAS y personas que no lo son, la persona salva ( hijo de DIOS ) tiene una relacion personal con DIOS y aprenden a perdonar. SEÑOR JESUS cuantas veces tengo que perdonar a mi hermano? setenta veces siete. Mateo 18:22 Conforme a las ultimas declaraciones del Sr.Bill Gothard pues el tendra que arreglar con DIOS y saber porque EL a permitido todo esto, a nadie nos toca jusgarlo , solo DIOS sabe exactamente lo que a pasado y las intenciones de todos. Que DIOS ayude al Sr. Gothard y lo restablesca . TODOS DEBEMOS SEGUIR A CRISTO.